An All-Day Boost of Focus And Energy To Crush The Day. As seen in The Discovery Channel's hit show, The Diesel Brothers. From Heavy D, Diesel Dave, Red Beard and The Muscle. We use a patented plant-based formula, called TeaCrine®, that boosts the effects of caffeine without the jitters or harsh crash. It stimulates the body and mind to give you enhaned focus and an improved mood. DRINK WHAT WE DRINK. BUY TORQUE. You can now drink the same beverage and chew the same gum that fuels everyone in The Diesel Sellerz shop. Torque is the only energy drink that keeps us truckin'. We donate a portion of our proceeds for every can purchased to support our veterans. A smooth lift without the crash that improves motivation while heightening energy and focus. 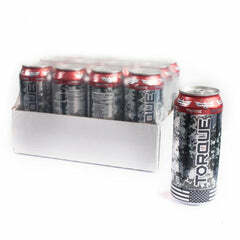 A portion of the proceeds from every can of Torque we sell will go to the Folds of Honor foundation, supporting the families of fallen or disabled service members.